Thanks much for inquiry and your interest in our "Schaeuberger's Dream" Imploder Products. Note how in the latest upgrade design we have increased the delivered magnetic flux to over 4700 gauss from 8 large surface area supermagnets- amplifying the implosive spin effect which makes molecular clusters spin independantly (smaller) - AND more soluble. combines the worlds most perfect implosive vortex nozzle- with the world's most powerful magnetic water treatment- producing the world's most powerful water solubility/ hydration solution- with the world's most proven track record of growth benefit! 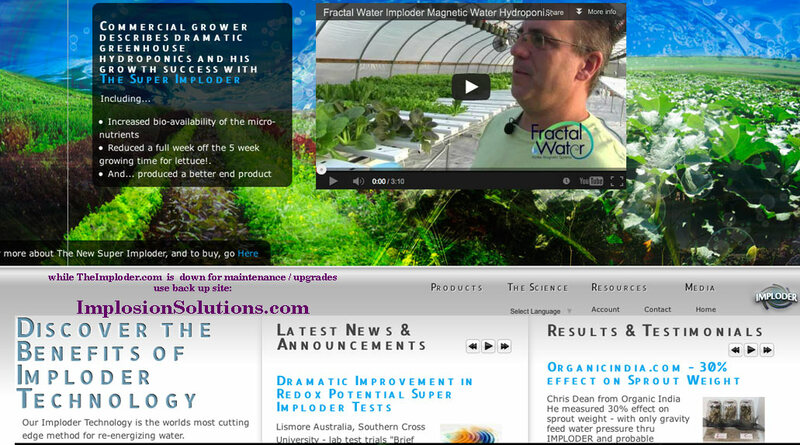 Commercial grower describes dramatic greenhouse hydroponics- growth success with SuperImploder..
- reduced a full week off the 5 week growing time for lettuce! .. and a better product. 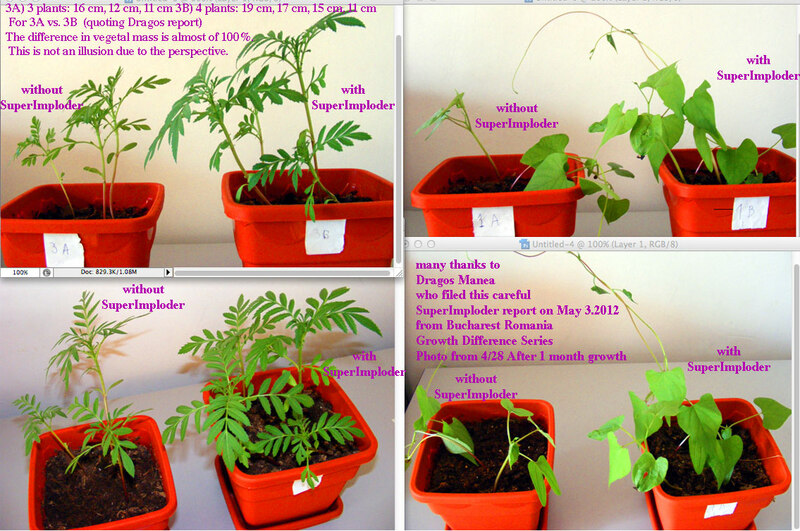 Multiple Reports- Large Increases in Plant Growth - when they are SIMPLY PLACED NEAR THE IMPLODER- NOZZLE! 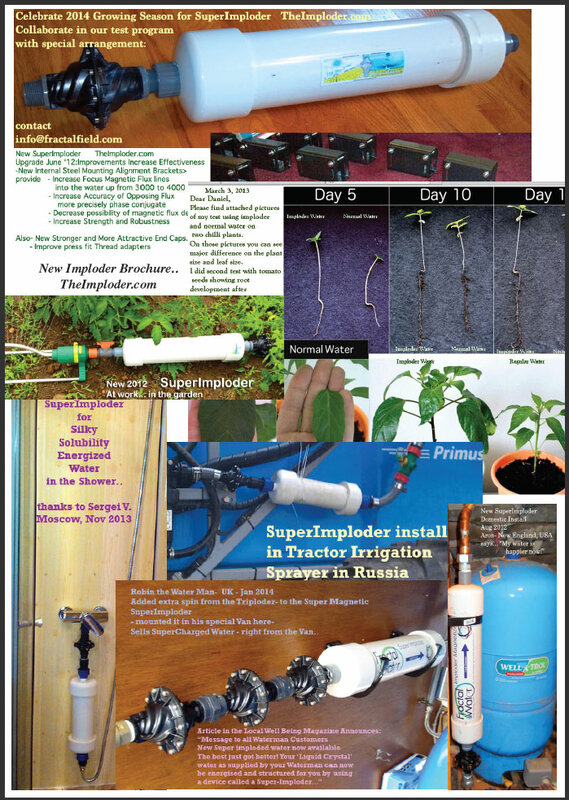 At first it sounds unusual- that there are repeated reports that plants simply growing NEAR the nozzle itself- benefit dramatically- without even touching the water which passes thru it. But - if you understand the physics- it makes simple sense! - Particularly - as there is usually some mineral etc. in the water (as there was in the Schauberger vortex which made electricity from gravity- as it spontaneously cooled / imploded)- in this case the vortex is PIEZOELECTRIC. This means that you are generating a CENTRIPETAL electric field (related to phase conjugate dielectric). The life force in a seed or plant- is proportional to how CENTRIPETAL is it's charge field. Thus the growth benefit to seeds and plants- is their response to a CENTRPETAL flux field- for exactly the same documented effect- where seeds germinate so much better in Stonehenge like dolmen circles. The piezoelectric quality of the water with minerals in it similar to the reason schauberger saw coldness increase in the vortex. 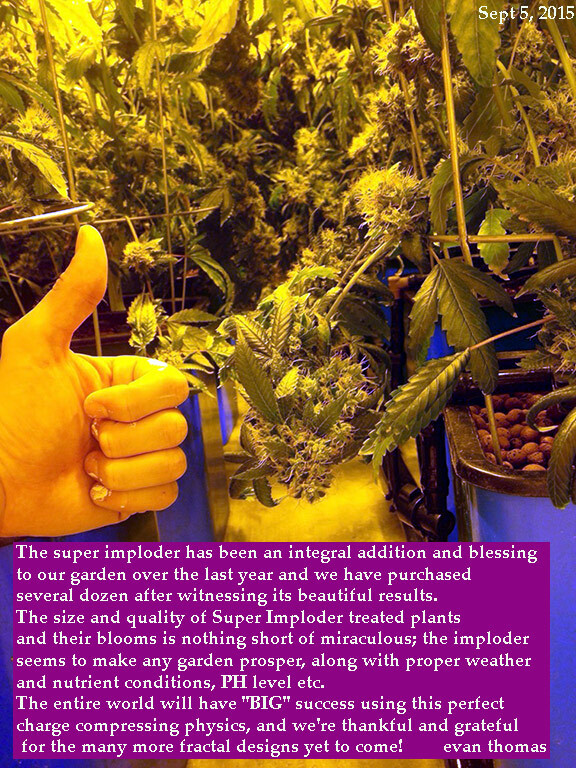 Hi Dan, The super imploder I bought a few months back is brilliant, thank you. I have some questions. Are you aware that the imploder nozzle when active generates a field of energy? This field enhances plants growth incredibly. ... what about a device that simply holds a small amount of water spinning in a vortex/imploder type manner to specifically generate this field? 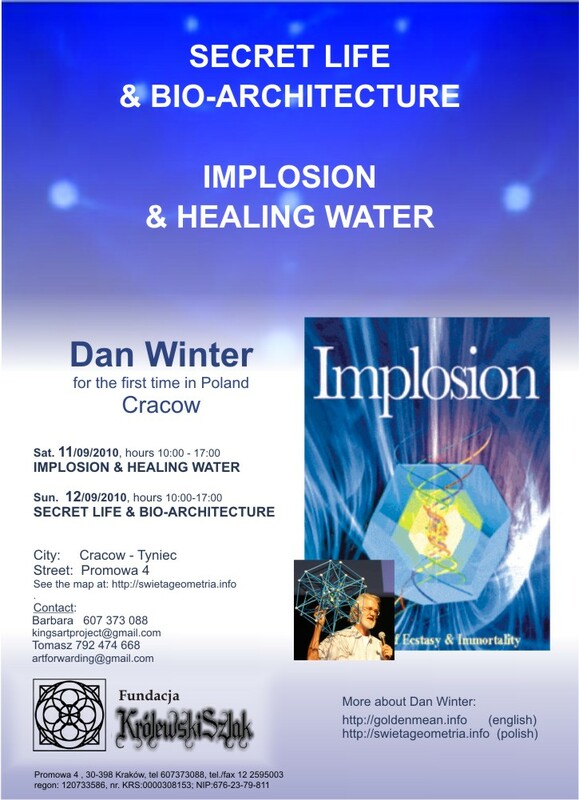 also on follow up - Carlo emailed again - Jan 2, 2013: Hi Dan, Well London water is cold and hard this time of year! I have to say this 'field effect' has got my attention! Can I get 4 x the nozzle alone to specifically explore this? Gonna try cycling water through one continuously and see what I can do with the field - great fun! 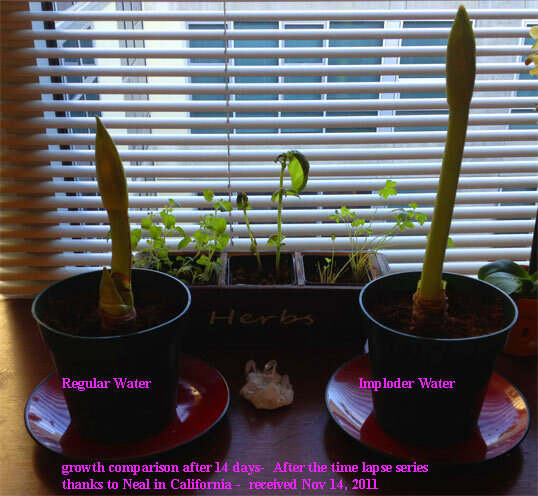 The imploder is used a few minutes a day but has doubled growth (just) by immediate proximity. 2. I forgot to remove the sprouts for several days and stumbled on them still in the cupboard. The bottle of sprouts with regular water had gone bad and had a rotten smell and visible mould, while the bottle of sprouts with imploded water had a pleasant smell of a good fermentation akin to beer or kombucha. A very profound difference ! Thank you thank you thank you! 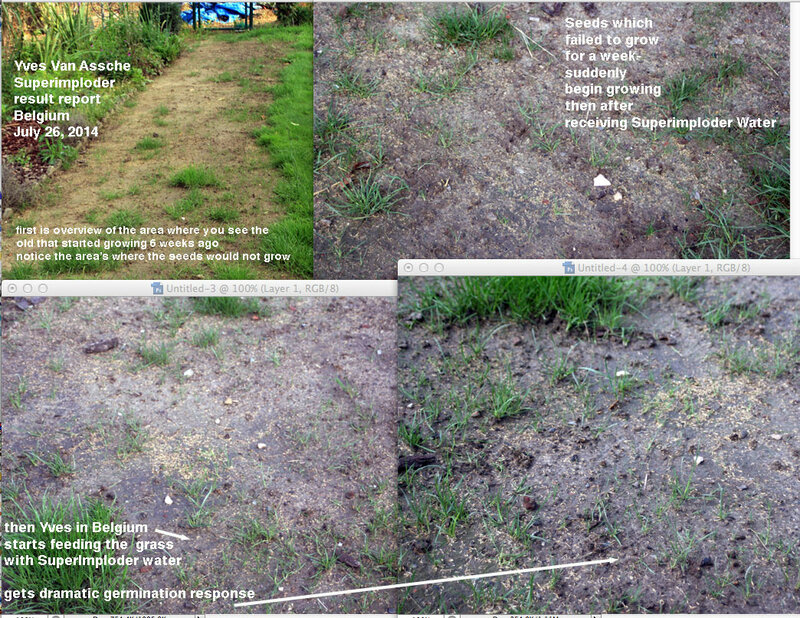 Amardeep N.
on July 19, 2014 - Yves Van Assche - from Belgium wrote: "Hello Daniel Just noticed the first extreme result from the magnetic vortex combined with the triple vortex .... My son in law had put lawn seeds over a 10 m2 three weeks ago ... he had less then 10% germination rate... he said the seeds were too old and had been too long in our glass house... When I hooked up the Magnetic combined with the triple vortex, I started irrigating the area ... after 5 days of watering with the vortex we have now near 90% germination...!" 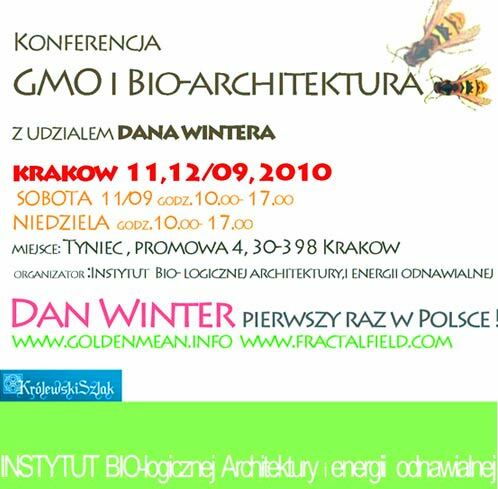 (picture)..
"Hi Dan, .. Yes, we got the Superimploder installed into the house plumbing. The results have been great. My wife when she comes down to visit on the weekends brings bottles so that she can bring water back with her. 3) Yippee, it looks like no more mineral deposits on the toilet. - The hand washed dishes have fewer water spots on them, where they used to have far too many. 4) A neighbor comes with their gallon jugs for drinking water. 5) It hard to gauge, but I think it augments meditation. This one has to many variables to say for sure. Further attention will be given. As far as gardening, I'll be getting the supplies for the indoor garden boxes in the next month or so. We're really looking forward to the results there. " 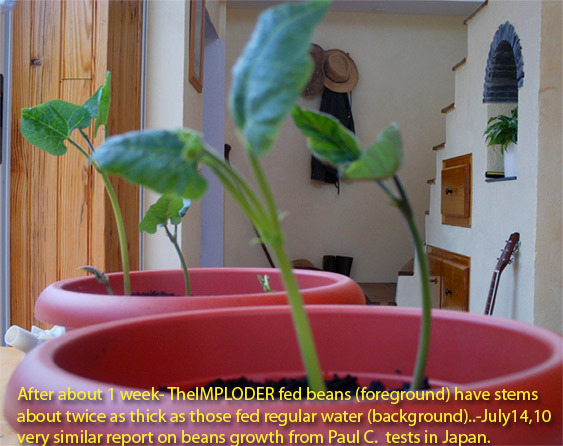 New- GREAT results- Mallorca- Dec 17, 2012- here is the report with pictures- DOUBLE THE WEIGHT RESULT IN IMPLODER WATER PLANTS! 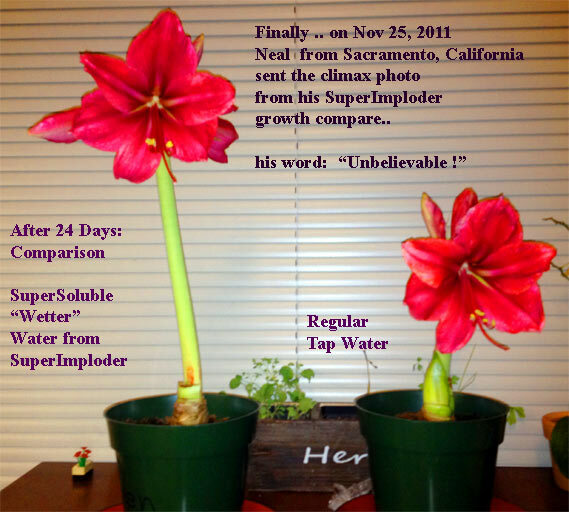 The SuperImploder is the most powerful magnetic water treatment device in the world today. 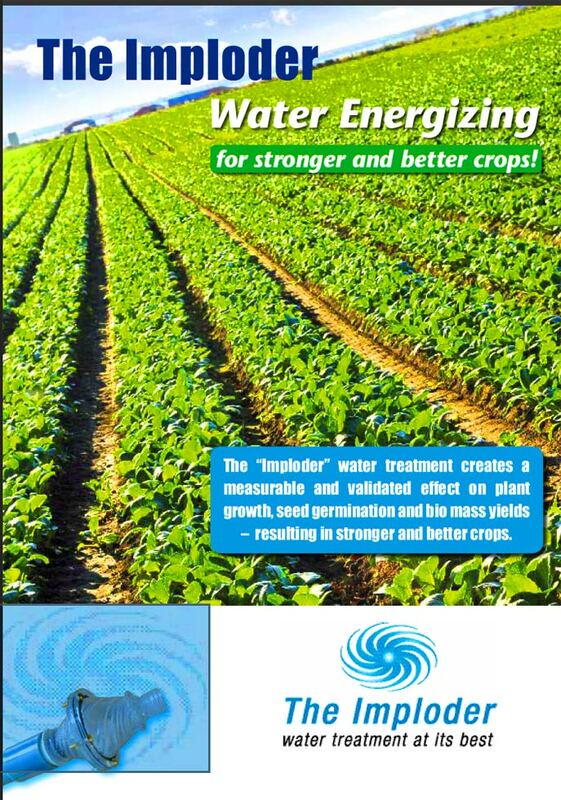 The published literature is overwhelming that strong magnetic treatment of water- is of benefit at many levels of agriculture. The SuperImploder starts with 8 large surface area 3000 + gauss magnets- which are specially treated during the sintering process (while they crystallize)- with a frequency signature which is phase conjugate- meaning their flux lines produce the pine cone (compression / implosion) - This is an example of the breakthru concept of PHASE CONJUGATE MAGNETICS - magnetic lines which are centripetal inside and outside the magnet. Restoring constructive compression ( net energy gain DURING constructive collapse)- is the essence of IMPLOSION: restoring centripetal forces. In addition to the uniquely placed and polarized extreme magnetics- in the SuperImploder- we add an IMPLOSION NOZZLE. The vortex in this fortron super-plastic nozzle is precisely designed directly from Dan Winter's new equation which for the first time predicted the radii of hydrogen only by multiplying planck length times golden ratio exponents. Not only is this the Implosion geometry for net energy gain during collapse- which is the reason hydrogen exists (all golden ratio based)- it perfectly predicts in vortex angle for perfect implosion in water. This is why we call our nozzle "(Victor) Schauberger's Dream"! Once the molecules of water have gained implosive centripetal force in their spin- at the molecular level- they then function like an armature entering a permanent magnet motor- as they enter the super strong magnetic fields. The result is decreased molecular cluster size- AND increased solubility. 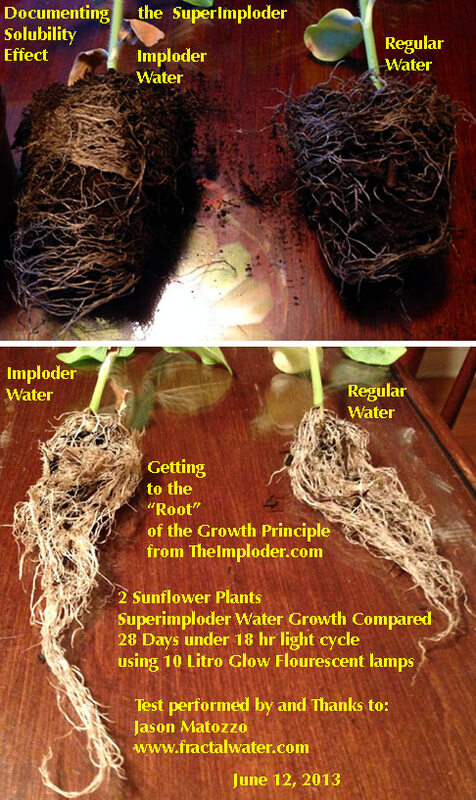 This is the major key to why the Imploder Water- is of benefit to most any growing thing. The molecules have more relative surface area (ready for solution)- in addition to their increase in magnetic coherent alignment. This is perfectly parallel to why the gold atom becomes super-potent to biology in the mono-atom state. Also why your blood cells are stronger (more soluble surface exposed) when they stand alone- without clumping into slimy groups in your blood. 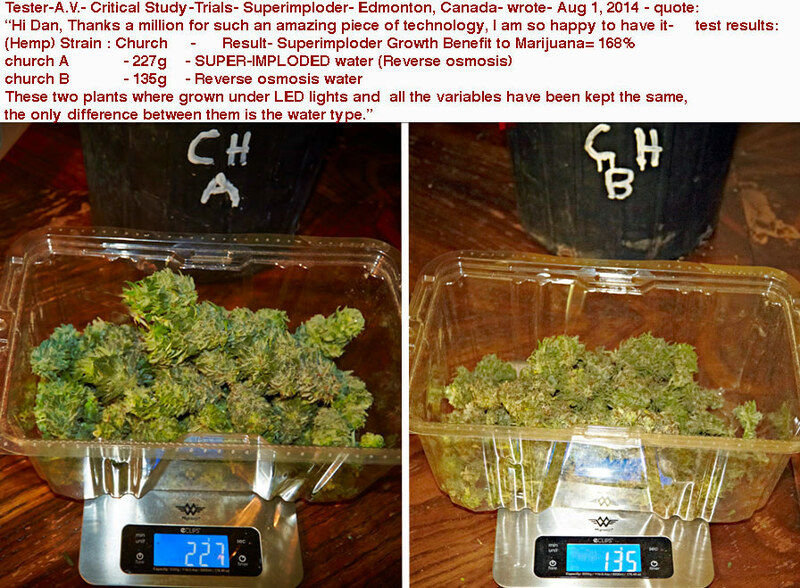 For the SuperImploder - this all shows up in extensive individual and laboratory testing. Unlike other weaker products- ( for example- omnienviro.com - which has no vortex, and structuredwaterunit.com which has no magnetics) - we also publish our own detailed tests- in addition to other public research on magnetic water in general. In addition to the dramatic 20-70 percent growth results you see in still and time-lapse photos all over our web sites- we consistently see - benefit in REDOX potential in lab measures. Redox- electron availability to react IS the essence of FRACTALITY- namely distribution perfected- for water! This also explains why the lab data shows dramatic reduction of things like chlorine in Imploder water. (see lab results). The molecules which least fit - (the chlorine molecule) are the first to be ejected. Spin density- like laminar coherence- is good for water- for the same reason centrifuges are essential for washing and industry. Perfecting compression (spin density) DOES the sorting. This also points to why so many sujective reports from people who drink SuperImploded water that they feel energized- when they drink it- even for a short time. In our lab in Byron- with the SuperImploder - we are consistently measuring useful change in redox potential (fractality= charge distribution efficiency). 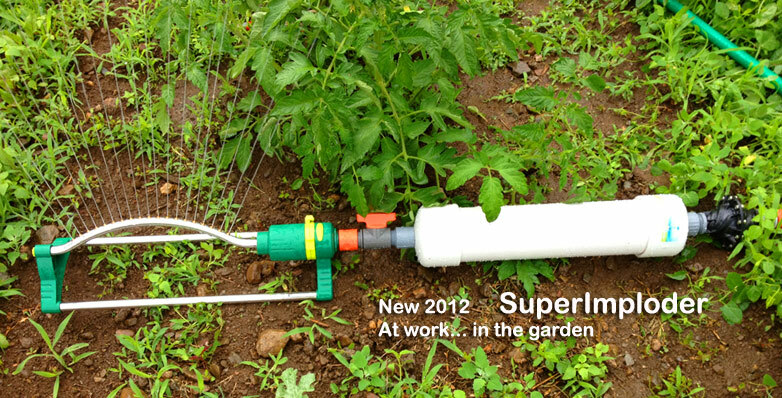 Our SuperImploder, altho new, is already in enthusiastic use in dozens of countries- join us on the cutting edge- adding life force to water - for life! 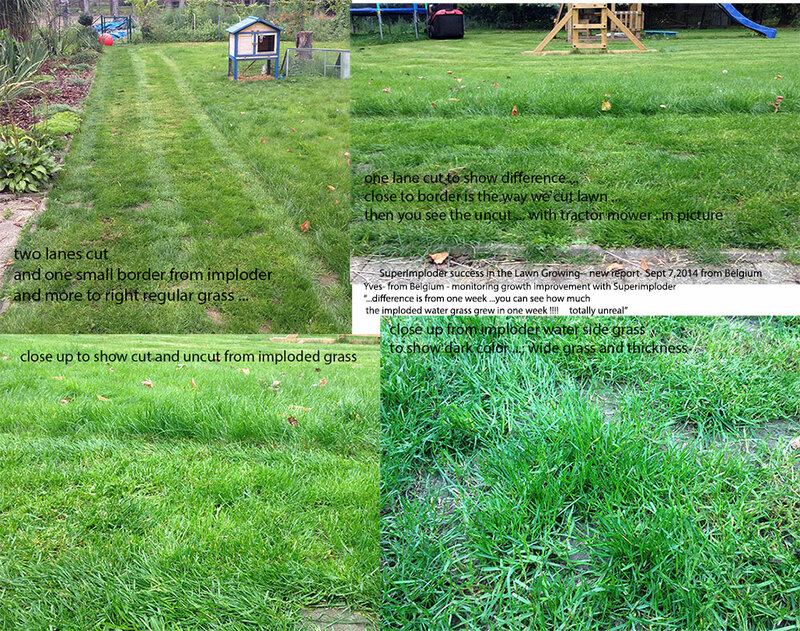 --Joshua D., wrote June 16,2012: "Hi Dan, I received the Imploder yesterday and started growth trails today. 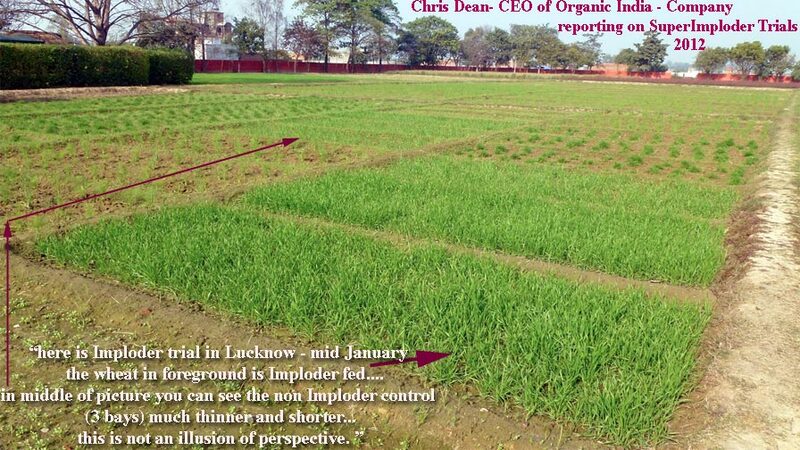 My first observation was soil holds the imploder-treated water far better than regular water. I'm using long planter pots with drainage holes and watering with rain water. The regular water escapes out of the drainage holes in substantial amounts even many hours after soil application. Thanks, Joshua D"
John C., wrote Aug 2012 - from CA, USA- My shower head and DVDs came 2 weeks ago and I've been using it. Love it. Water is definitely different and more lively. I just feel better after using it overall. I have some thoughts and experiences with the imploder for the month I've had it. Used it for drinking and my jacuzzi water. I have a 800 gallon jacuzzi 10 ft by 8ft so a decent size pool that will seat 12. The water supports more life energy, so much so that I was putting in the maximum amount of chemicals (bromine and chlorine) and the algae bloom would not die! This would indicated more dissolved oxygen in the water as well. The super imploder is not recommended for filling pools and spas or ponds because of the ease of algae growth. This is to be expected because your products are intended for plant growth and sustaining life. It definitely overcame the chemicals I put in to keep the water clear which is exciting because it seems the proper use of this product will overcome a polluted environment! Bathing and drinking in the water, even just soaking my feet produced a overall feeling of well being and clarity of thought. My head would ring quite loud and the world in general around me seemed sharper and more defined. I just feel more aware and alive. Very cool! It should be noted that all water at my house is treated through a whole house (waterboy) water filter and is already purified and softened through their proprietary technology which I believe is the healthiest and best out there available right now. So my water is purified through the Waterboy and then structured and energized by the super imploder. I also took the time to water my sago palms and basil plants and the plants simply loved it. One sago that was not doing as well as the others (brown and yellow areas and slower growth) perked up noticeably and is now a healthy vibrant green. My basil seems more fragrant and stronger tasting. it should be noted that no nutrients or chemical fertilizers have been added to my plants in over a year! I only watered maybe 6 times in two weeks at the most. 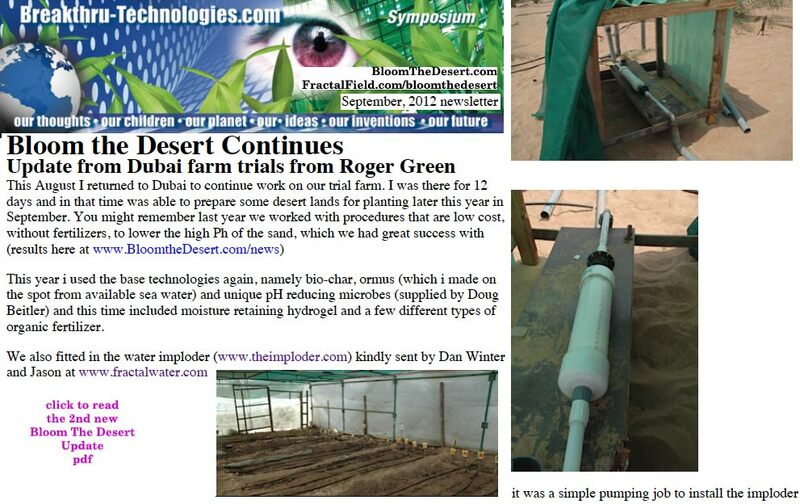 Thomas G- wrote Aug 7,2012: from CA, USA- Hello Dan and Roger, > Thanks for the latest news on the Imploder. 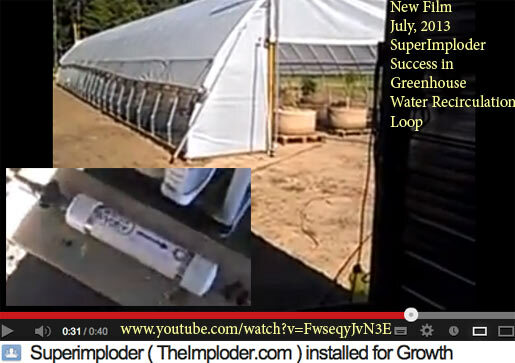 A while back I purchased an Imploder from Dan and it is now installed on my home farm located in Georgetown, California. I've enclosed a photo. The device is fantastic. I am growing vegetables on poor quality soil and getting great results. All the plants are incredible pest free as well. > When I purchased the Imploder from Dan over a year ago, I promised him that I would send a photo after I got it installed, so I want to be sure he gets it. (above) - I met Dan in Calgary, Canada almost 2 years ago, so I hope he still remembers me. I've been very interested in his work since then, not only from a scientific interest but from a spiritual as well. >> Thanks again for all your work on the Imploder. 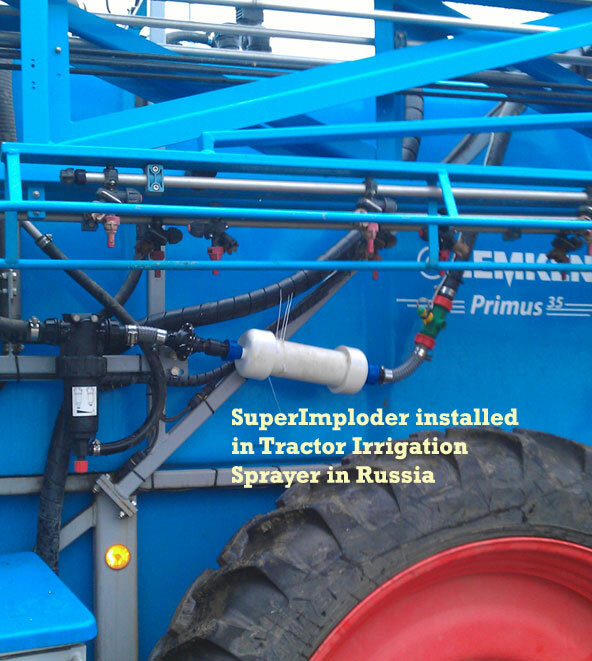 > Sincerely, > Thomas G.
Nov 2013: SuperImploder mounted on TRACTOR IRRIGATION SPRAYER- in Russia! Just a reminder to all SUPERIMPLODER USERS: The water must ENTER and the black nozzle end (spin before magnetics entry). The water must EXIT the white magnet tube end! 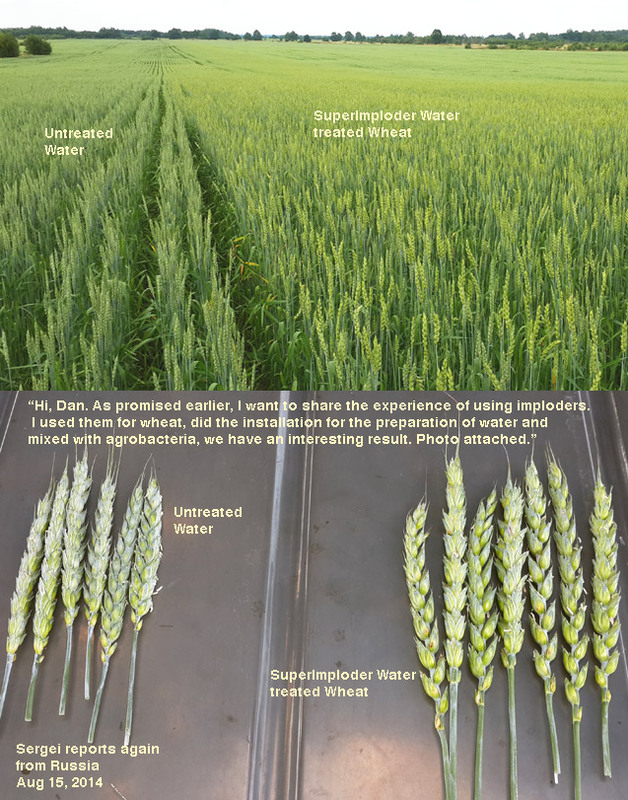 testing SuperImploder -The design of the new SuperImploder- is specific - in that the original Imploder served germination phase growth more than fruiting phase. 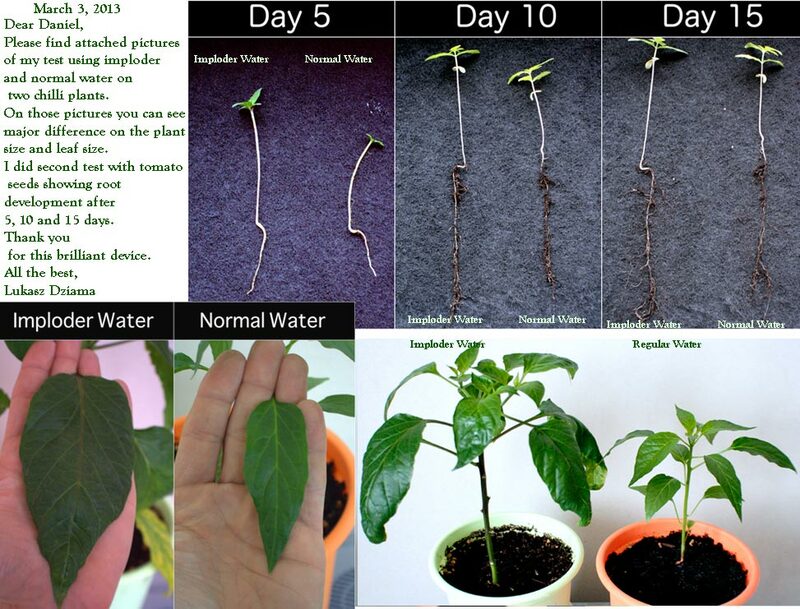 To prove the new design - in HYDROPONIC environment- just as the plants approached - fruiting phase- (same plant type, soil, environment and water amounts)- one comparison set of pepper plants were given Superimploder water to compare. from Dan - July, 2010- Hi.. I was skeptical myself- so many science folks helped us with the original tests.. I had to test the replicability of this effect myself. 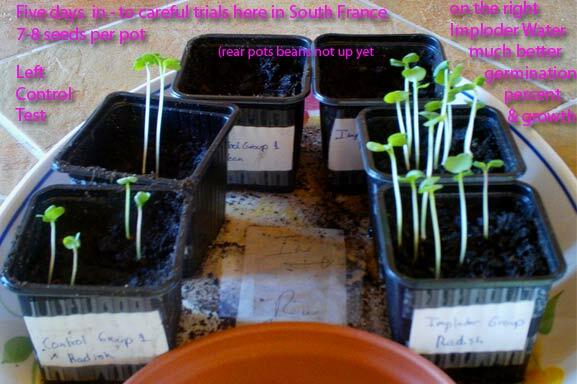 Now we have set up yet another real trial group here in South France- (thanks to Colin and his wonderful family) and as of today- I am absolutely convinced- this growth effect is replicable! Here- after only 5 days- we already had this dramatic difference in growth.. We had placed 7-8 radish seeds in each pot- look at the difference! Imploder water fed pots on the right. 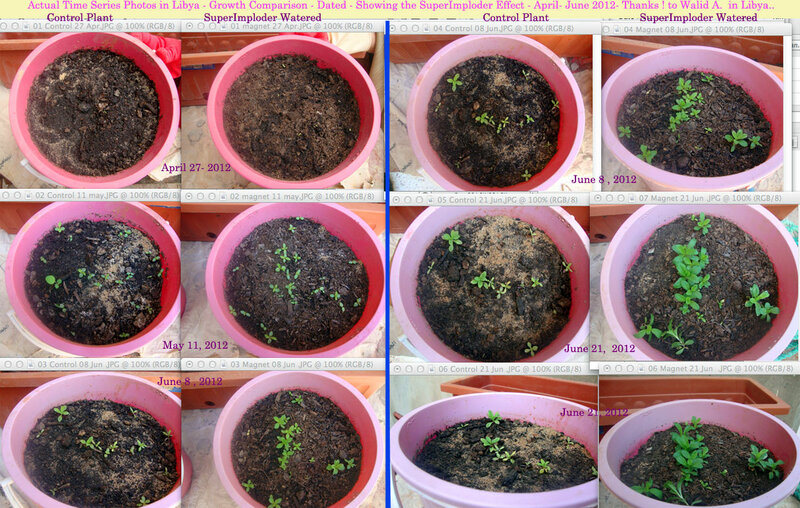 Many more seeds germinated AND grew much better. (we also put Imploder water in the swimming pool there at Colin's - we are all sure that it is more 'silky' water -everyone agrees much nicer swimming.. as well).. Note in this growth - study we started with very nice mountain water. So - the effect is across water types. In UK we had water which had notably bad re-dox potential measure for growth. There we got such a dramatic (328%by weight!) growth effect. I was doubtful this would happen when starting with good water. But.. here we are next to mount Canigou- with nice mountain water- and STILL this dramatic difference! 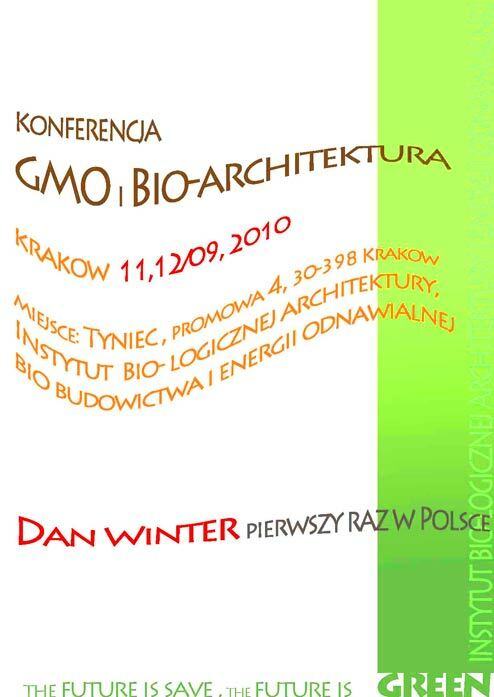 "Dan, Please find attached the close out of the radish test. 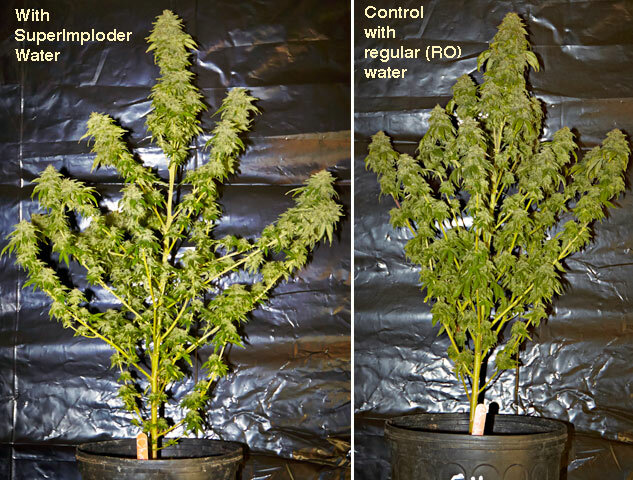 This is the one from the black containers that showed dramatic differences when comparing Imploder watering and regular water. 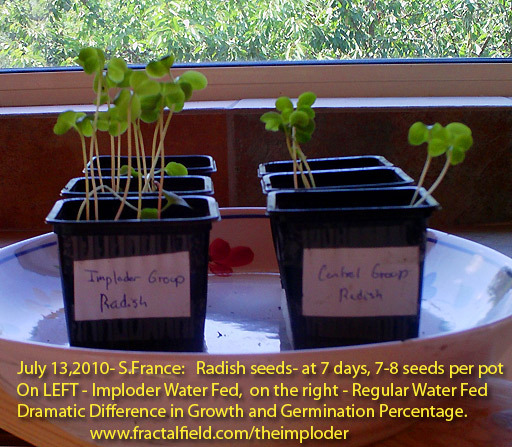 - The end result of the radish was double the weight primarily due to the rate of germination. We planted the same number of seeds in each container and the results were 3g of regular water radish and 6 grams of Imploder water radish. ... New test underway tonight to test peas, beans and tomatoes for effectiveness of the Imploder water. The Imploder is based on phase conjugate HYDRODYNAMICS (liquid implosion- see nozzle below..
& of the origin of (self organization) in Time! Fractal Field: Technology: The IMPLODER- Now Available :--Note the growth effect and reduction in entropy etc below. Just spoke with Vern. He did some rudimentary work with the Imploder on himself. He found that our imploder water felt as good as the one he has in his house which has no magnets, the effect was immediate." Mar10,10:Blockbuster Physics Summary:Overwhelming Evidence:PLUS:Best FILM SERIES EVER-Aussie10Reviewed Golden Ratio Fractal Phase Conjugation causes Gravity, Perception, Color, Life, Time: All Centripedal Forces. , PLUS -ElNaschie GOLDEN QUANTUM FIELD THEORY - PLUS:NewRelease THEIMPLODER-Ready for YOU to Try..